Here is a fun appetizer to start off pretty much any meal, they are easy to make, taste pretty darn great and are just to eat! Enjoy! 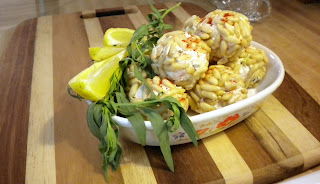 In a medium mixing bowl mix together all cheesy ball ingredients except pine nuts until mixed well. Roll into 12-14 balls and sit on piece of wax paper. Roll each ball in pine nuts until mostly covered and then place on a wax paper covered backing sheet. Sprinkle smoked paprika over the tops of the cheesy balls, cover with a sheet of wax paper and refrigerate for 20-25 minutes or until ready to eat. Just before serving squeeze fresh lemon juice over the cheesy balls and enjoy!